Isn't it amazing that one little day on the calendar can whip a whole school district into a frenzy? Dec. 1 ... one day, but it can have such an amazing impact on funding that it becomes a universal day of checking and double checking! Of course, your state may have chosen another date — the regulations state [300.641(a)] each state must pick a date between Oct. 1 and Dec. 1. 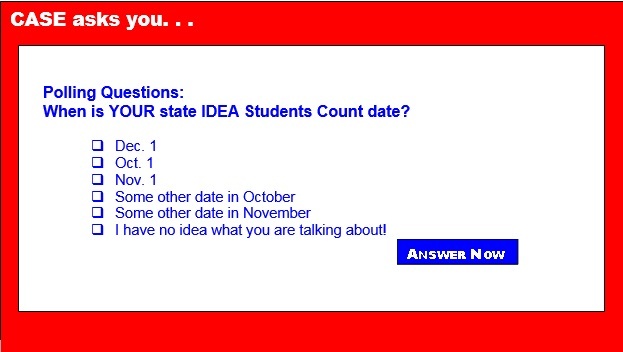 But I am pretty sure almost half of the states use the Dec. 1 day as their official IDEA student count day. In fact, that is our poll for this week — I would love to have at least one person from each state to answer our poll this week ... so don't assume someone else from your state will do it — just answer it! And for all of you whose states do use Dec. 1, happy count day! Speaking of December... I hope you explored and passed on the information about the Hour of Code for the week of Dec. 7-13! It is almost here and the time to sign up is now. Just think $10,000 worth of electronics for one public school in every state! But this is worldwide so our Canadian members can also promote this for their schools too ... and the biggest deal of all is every student is a winner! 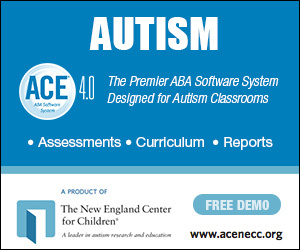 I have looked at some of the lesson plans and they are really cool! What a great after school program supplement this would be! Just saying — don't let this opportunity pass your district by! And while we are talking about amazing opportunities not passing you by... Registration is up and running for the 5th annual Hybrid Conference to be held Feb. 11-12! 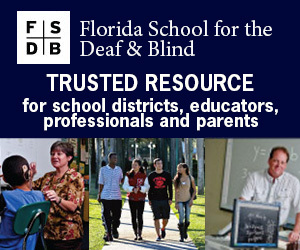 Dr. George Batsche will be leading the Thursday session: Actualizing the Practice: Identification of Students with SLD within an RtI/MTSS Framework — Accurate Eligibility and Effective Instructional Practices. Dr. Batsche will be stressing the need for multiple team members from across varying roles so be sure to sign up for a Virtual site and bring lots of cross stakeholders to the Thursday session! I hope you all had a great Thanksgiving... Though for our members to the north, Canadian Thanksgiving is celebrated on the second Monday of October and has since 1957. Just like in the USA, it is a chance for people to give thanks for a good harvest and other fortunes in the past year. I am sorry I missed noting this holiday for our Canadian readers! Because of the holiday last week, I wrote this article a week ahead so I don't have the results of our poll on what you were most thankful for given the list I provided. Next week, I will reveal the results of both polls, so please answer this week's poll and remember to give me suggestions on future polls too!